Ripley’s Aquarium of Canada aims to foster a culture of sustainability that supports the environmental protection and conservation goals of the organization and the greater public, while building a strong legacy of ecological stewardship. The Aquarium participates in many different programs, initiatives, and charitable donations that contribute to marine conservation onsite, in the community and internationally. Some programs include our bi-annual Shoreline Cleanups, banning the use of straws and lids in our facility and promoting the reduction of plastic pollution, annual Lionfish Invitational in Flower Garden Banks National Marine Sanctuary, and donating to like-minded local charities such as the Ontario Turtle Conservation Centre and Lake Ontario Waterkeeper. With educational experiences offered onsite daily such as our Dive Shows, Aquarist Talks and our new Discovery Dive – where 10% of proceeds are donated directly to the Shark Research Institute – we hope that after guests experience our facility, they will be educated about current marine issues and inspired to help. From onsite initiatives like banning lids and straws, to community programming, Ripley’s Aquarium of Canada is dedicated to combating plastic pollution and helping to save our Great Lakes. Canada strictly adheres to the utmost standards of animal welfare and security. Our highly experienced husbandry team consists of over 30 animal experts responsible for monitoring and caring for our animals 24 hours a day, 7 days a week. To make sustainability an organization-wide priority while creating a culture of environmental awareness, the Aquarium has developed the Blue Team. This team of staff from all departments meets regularly to discuss and promote environmental initiatives while motivating other employees. Litter in the environment can have devastating consequences for wildlife. Twice a year, Ripley’s Aquarium of Canada hosts a shoreline cleanup to help clean Lake Ontario at the mouth of the Humber River. Join us today! Coral reefs are very sensitive, slow-growing communities that are currently facing multiple threats. Our aquarium supports the protection of these reefs rather than the displacement of them, which is why almost all of our exhibits feature artificial coral. 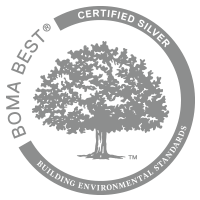 BOMA Canada offers the country’s largest environmental assessment and certification program for commercial properties. Ripley’s Aquarium of Canada has achieved Silver Certification relating to the facility and best practices.